Looking for ideas for what to get family and friends for Christmas this year? 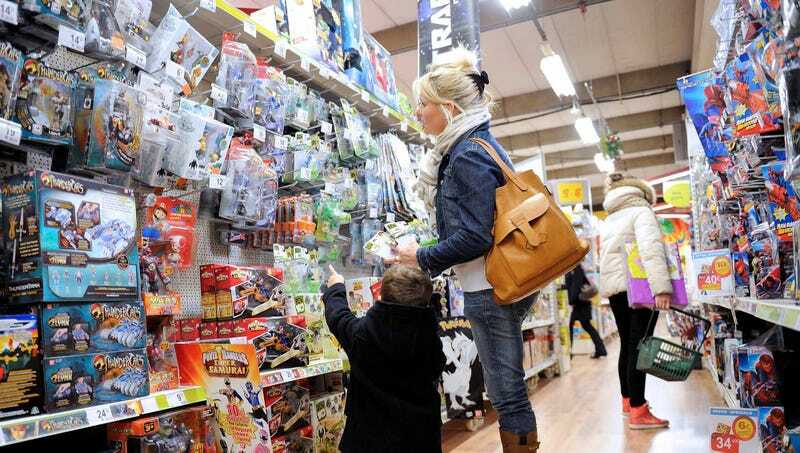 Here are the top-selling Christmas gifts in 2015. Star Wars Battlefront For The Wrong Console: Mothers everywhere are snapping up this blockbuster video game incorrectly purchased for either Xbox One or PlayStation 4, even though they were specifically asked to get it for the other device. Craftsman 6-Foot Couples Ladder: Why perform household tasks like changing light bulbs and vacuuming high windowsills by yourself when you can share them with the one you love? Now you can, with this handy 6-foot-tall, 5-foot-wide utility ladder. Cinnamon Roll–Infuser Water Bottle: For those who are tired of drinking bland, flavorless water, this new bottle from InFuzeH20 features a slick colored-glass design and extra-large infusion chamber to accommodate even the largest breakfast pastries. Brookstone Thing For Your Feet: It pulses them or ionizes them or something. It’s got a blue light on it. Battleground: Mosul Lego Set: Your kids will enjoy countless hours of entertainment putting together and playing with this elaborate 500-piece set that recreates one of the most exciting and action-packed killing fields in Iraq. Checkers Expansion Pack: The 2015 expansion pack features 16 brand-new squares and four additional checkers. 5 Pounds Of American Pharoah Meat: Shipped overnight in an insulated cooler and available in a variety of cuts, including shoulder, flank, and chuck, five pounds of the Triple Crown–winning horse is a once-in-a-lifetime gift for the horse-racing lover in the family. Sweater: I thought you would look nice in it. Nike Joey Crawford Signature Black Referee Sneakers: Nike stores nationwide have struggled to keep up with the demand for legendary NBA referee Joey Crawford’s signature all-black sneakers with durable laces and firm support—designed by the iconic ref himself! Cookbook Eligible For Amazon Prime: An old favorite, one of the cookbooks that has the little Prime logo next to it and is eligible for free two-day shipping by December 22 that has guaranteed arrival by December 24 is once again a top choice this Christmas season.